Made in the woodworking shops of Seiffen Germany in the Erzgebireg Mountains. 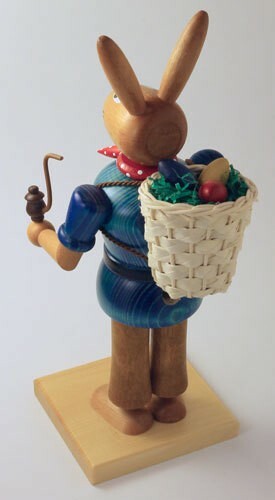 With his basket filled with treasures and holding his snack in his hand this Large Hiker Bunny German Smoker is ready to seek adventure. Stands about 9 3/4 inches tall and was made in the woodworking shops of Seiffen Germany in the Erzgebireg Mountains.